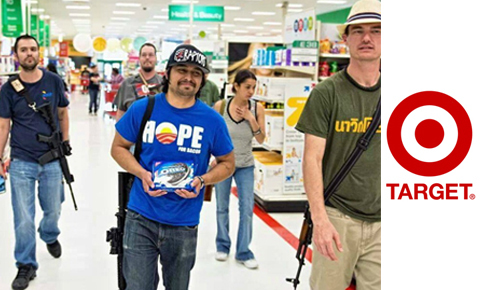 Gun extremists armed with semiautomatic rifles have walked into Target locations around the country, weapons out and loaded, making sure customers saw their guns. Target, which boasts on its website that between 80% and 90% of its customers are women, has no restrictions on customers carrying guns in its stores. Chipotle, Starbucks, Chili’s, Sonic Drive-In, and Jack in the Box have already responded to petitions from moms and other gun sense supporters asking the stores not to allow guns. Now it’s up to Target to protect families who shop in its stores. Sign the petition on the right to automatically send a message to Target’s CEO asking him to create gun sense policies to protect customers in its stores. Please issue gun sense policies to keep your customers and employees safe from the risk of gun violence by protecting against people openly carrying weapons in your stores. Carol N. just signed the Target: Create Gun Sense Policies in Your Stores petition. Thadius D. just signed the Target: Create Gun Sense Policies in Your Stores petition. Colin P. just signed the Target: Create Gun Sense Policies in Your Stores petition. Ralph C. just signed the Target: Create Gun Sense Policies in Your Stores petition. Susan C. just signed the Target: Create Gun Sense Policies in Your Stores petition.